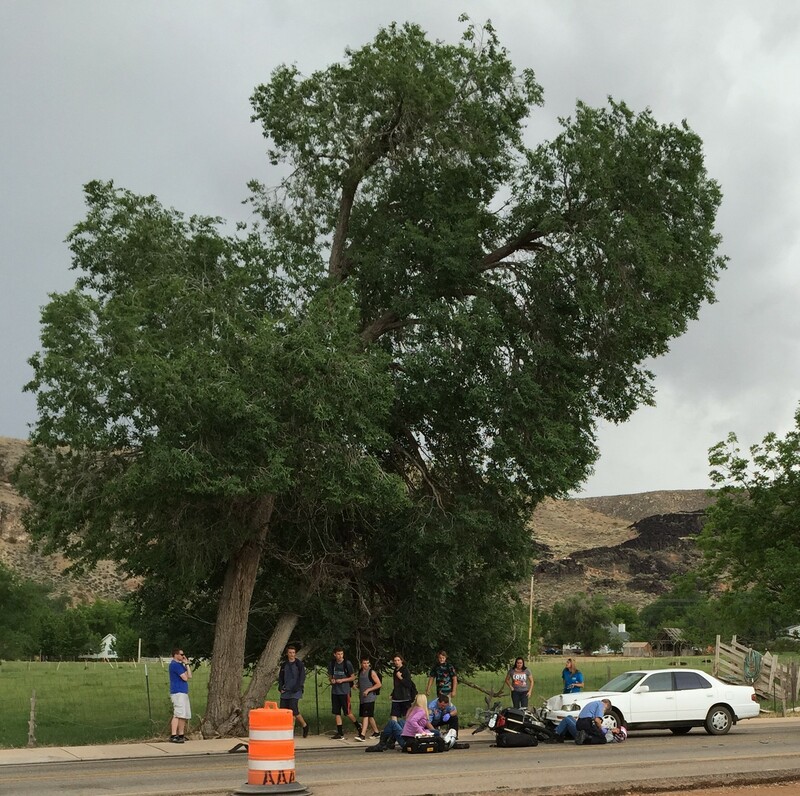 LAVERKIN – Road construction-related traffic congestion played a role in another accident on State Street in LaVerkin Friday, resulting in two people being transported to the hospital. The accident happened near the intersection of 200 South and State Street at approximately 2:53 p.m., when traffic slowed down because of road construction and reduced lanes on the street, LaVerkin Chief of Police Benjamin Lee said. Lee said the driver of a white Toyota Camry hit the back of a BMW motorcycle that was carrying two riders. The impact pushed the motorcycle into the back of a silver Nissan Altima, and the passenger on the motorcycle hit the back of the Altima. Hurricane Fire and Ambulance transported the motorcycle’s driver and passenger to Dixie Regional Medical Center. Lee said he did not know what injuries they had sustained nor the extent of their injuries, but medical responders deemed it necessary for them to be taken to the hospital. Lee said the two riders on the motorcycle were wearing safety gear. No other injuries were reported to police as a result of the collision. The incident caused more traffic delays on State Street, as deputies from the Washington County Sheriff’s Office rerouted traffic from the scene of the accident around 300 South and Center Street. Lee said traffic was rerouted and slowed for about 45 minutes. The Camry and motorcycle had to be towed from the scene. Since the Altima’s damage was mostly contained to the rear bumper, the driver was able to drive the car from the scene. Lee said he did not have exact numbers on how many accidents have happened since road construction began on State Street, but he guessed that most of the 15 accidents that happened in LaVerkin last month were at that area. This construction site is VERY dangerous! I am surprised no one has been seriously hurt up to this point. You take your life in your hands ( I mean that) trying to get on or off the street here. I can’t believe they are doing this during tourist season. I understand the road needs work but this construction site is a real mess. There are two narrow lanes of traffic each packed with cars driving so close to each other that they almost scrape each other’s door handles as they pass one another. You have to drive across the road construction while the heavy equipment is in operation to get on or off the road then you have to get out into this heavy traffic which is coming from both directions. You can’t see clearly to do that so you just have to take a huge chance when you pull onto the street. You have to be careful not to hit any road construction workers. They are all over the place. You never know when a road entrance is closed especially at night so you can find yourself in a situation where you turned to get into a road and you are right in the middle of a construction mess instead. Try making a left hand turn in this kind of traffic especially at night. This street has no lighting so you are begging to be rear ended if you try to make the turn. I can’t even believe they are doing this. These accidents were totally predictable and totally preventable. This construction is major. It is going to go on for a while and they are going to keep having accident after accident. Oh and there is an elementary school in the middle of all of this also. Kids are crossing the street and riding bikes in the area. can you say “inbred hillbilly construction planning”. Couple that with open book driving test and … 2+2=5, welcome to Utardia. Though I feel for you having to turn out of your neighborhood into this construction and I feel for the businesses trying to keep their customers, both accidents listed here in the last few days were simply people going too fast and not paying enough attention to the slowing of traffic. The construction zone is better than I expected. Through traffic is fine as long as people slow down and pay attention. I understand why they have to do this construction now and not in the winter months when rain would hamper the progress but it seems that the road crews aren’t concerned about their own safety much less that of the traveling public. When this started I witnessed the first accident and became concerned right away to the point that I made a call to UDOT and requested they at least post slower speed limit signs and have flag men out to help slow people down. I got a call back from a guy from UDOT and was told that they wont slow traffic because “people don’t want to go slower” and it is an inconvenience to do so” REALLY? I told him wait till someone gets killed. Oh thats not gonna happen he said. WOW! Now a month into this 4 or 5 month project 15 accidents so far. Pathetic! Wait till it gets busier out there and see how people react to being held up time and again when accidents close travel completely during emergency responder and investigation delays. That is IF they can even get to the scene. Just a few simple precautionary steps now could alleviate a lot of problems later on. 3. Re route trucks and tour busses around through Toquerville unless they have a local delivery. There is not enough room for them on those two narrow lanes. Or just wait till someone is killed and Interstate Rock will get their butts sued due to negligence. I hope something gets done soon out there but probably not. We will see.